No, not that law of attraction stuff, but the secret to how I do something in the office bathrooms that not everyone seems to be able to manage. I choose to believe people do this not because they are lazy or inconsiderate, but because they don’t know how these toilet paper holders work. They’re not like the typical home models, where there’s a springy, removable rod around which the toilet paper rolls. Perhaps people assume they require a key or special tool to release the roll; I have seen offices that lock up their toilet paper like that. These holders, though, are not high security ones. The secret? You’ve just got to grab onto that sucker and squeeze in the right place. It’ll pop right open. I am not even going to get into the over vs. under debate, though you can state your preference in the comments. 2007: Livin’ the Dream and Animal, Vegetable, or Mineral? Over, no question. The only good reason I’ve ever heard for under is if you have cats. 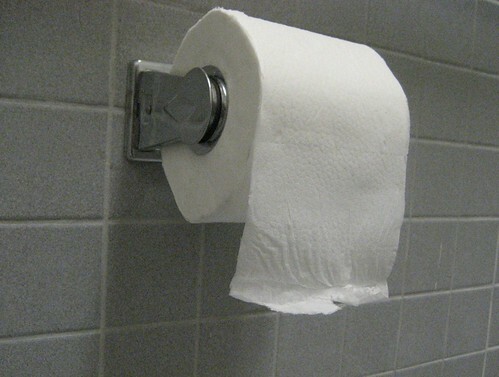 Thankfully, we don’t, so we can put our TP on the right way.